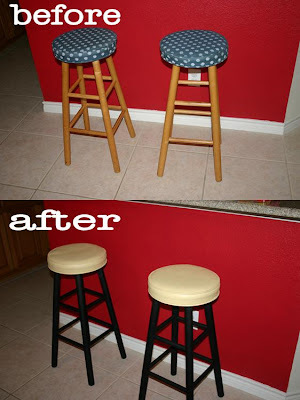 I recently finished a makeover on some bar stools I've had forever. I spraypainted the legs black, and I painted the fabric seat 2 coats Kilz and 3 coats paint. I decided if I messed up painting them, I could always just recover the top with a different fabric. 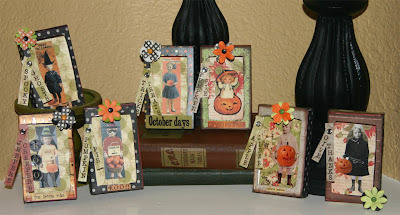 Fortunately, I followed a great tutorial on Twice Remembered's blog which helped me from start to finish! Next up I'm trying to decide what to paint on the top of the seats. Maybe a "1" and a "2"? Maybe "sit" or "eat"? Maybe a fleur de lis? Maybe "bon" on one and "appetit" on the other? Now taking suggestions and every comment is a good one! 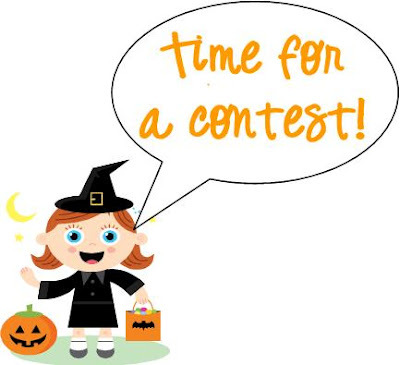 If I choose yours, you'll get one or three of these Halloween candy box makeovers...so post your suggestions no later than Sept 30. Linking up to CSI Typography Projects!